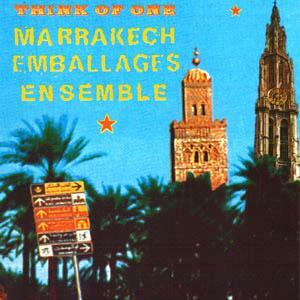 THINK OF ONE "Marrakech Emballages Ensemble"
Crossover doesn't need to be a mix of rock and funk. Sometimes people cross completely other soils and territories (ask David Attenborough) : a rather strange combination like this is to be listened to on "music makery" Think Of One's project "Marrakech Emballages Ensemble". Wether they went down there to wrap up a minaret à la Christo, I wouldn't know, but certain is that David "Bollekes" Bovée & co went to Morocco on a musical discovery tour, met some interesting musicians, invited them to Belgium for a few concerts, and recorded this cd during those encounters. In this collaboration with the "gnawa"-singer" Abdel Kebir Esager and the female vocal- and percussion-trio "Bnet Houaryet" three musical horizons seems to clash upon each other : there's the repetetive, African element (in the guitars, or in the percussion), there's the Arab way of melody and frasing, and there's the Zappa-ian rock & rhtyhm that the Belgians took with them across the Atlas. In turns, this exotic and this arty side get the upperhand. Best are tracks like "Walz Delire" (a song that is also on "We Need New Animals" by D.A.A.U. ), "Alelaminena" (with the occasional burst into a Arabic form of speedmetal) and the steaming, hypnotizing opener "Marrakech II". There's also a flipside to this method, though : some songs are overly repetitive and monotonous (at least for these untrained western ears), and the percussion ressembles a herd of cows on their way to a Swiss alp. A minaret next to the Antwerp cathedral on the sleeve, that's without a doubt a sort of statement in the Antwerp of today. Yet this project does not have the feel of a "political" message. The path of such a multi-country collaboration is not always paved with roses though, as was proven when Think Of One had to forfeit their plans to bring this Moroccanproject on the Pukkelpop-stage last week, because the invited musicians couldn't enter the country. The group then switched to "Antwerps", something they will also do on their next project "Naft". Some of the members meanwhile have started a brand new project with North-African roots : "El Baroud" is a belgian-moroccan raï band. MB in Rif-Raf : "This collaboration give a new meaning to the term "world music" in a very natural way ... A waltz in Maghreb-style of a contrabass-trance that would make a derwisj start whirling, Seefhoek-melancholy and desert rhythms with blazing horns, it's all in there". You can order this CD from a number of locations (prices researched on August 30th, 1999, but nothing guarantees they still are the same when you read this).